Remember the colorful desk inspiration post? Well, I was certainly inspired… and here is the result! 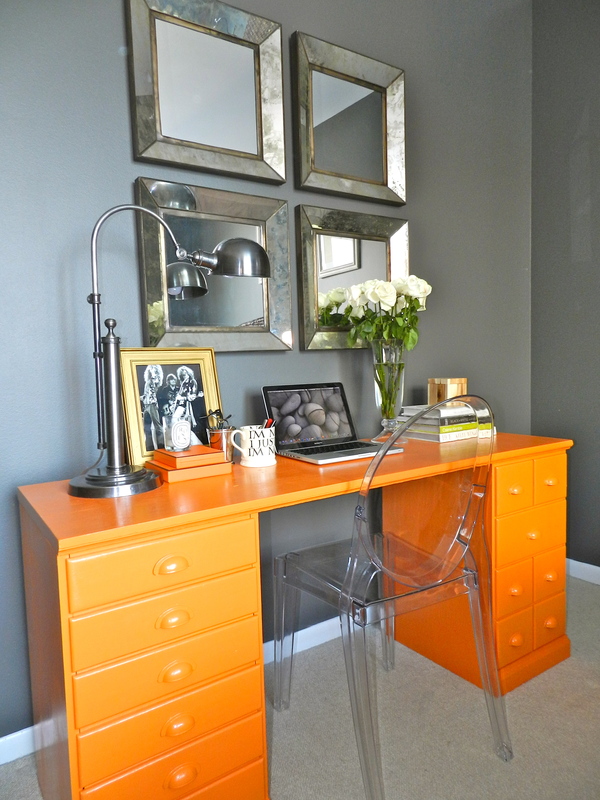 A few weeks ago I knew we needed another desk, and I knew I wanted to add a pop of color to our grey & white bedroom. I fell in love with this desk a year ago because it has so much storage space (crucial in our one bedroom apartment) also this desk is wide but not that deep (again, perfect for apartment living). We have the same desk in our office area (in black) but it was quickly taken over by my boyfriend, so when we ordered another one I knew I had to make it look completely different. After a quick sanding, and a few coats of Benjamin Moore’s Aura Paint (my go to for furniture painting) in “electric orange” it was good to go. The color was inspired by my two little Hermes boxes that I keep pens, etc. in… I think I was the only person at the hardware store trying to match Hermes orange, but I found it! 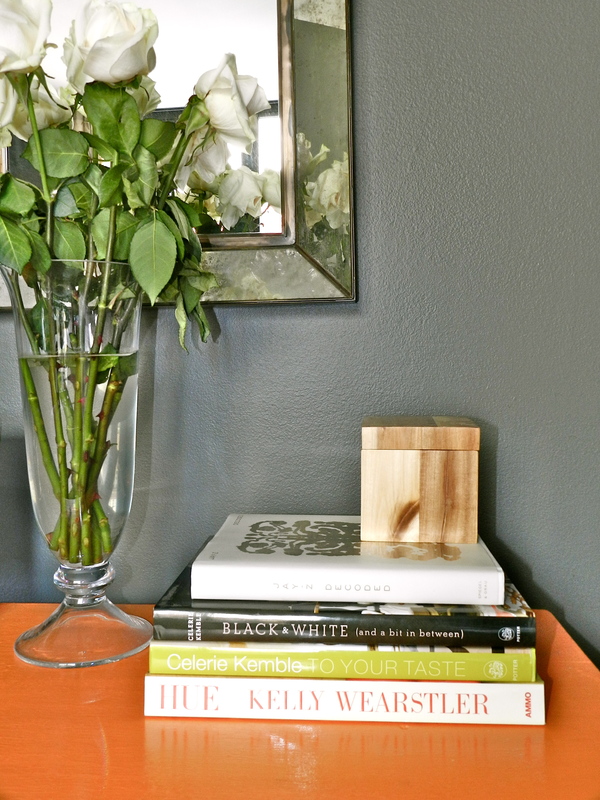 The Aura paint is so amazing I was even able to paint the metal drawer pulls to keep the look monochromatic. Then came the best part- accessorizing! Needless to say, the boyfriend and I now have 2 very different work spaces. 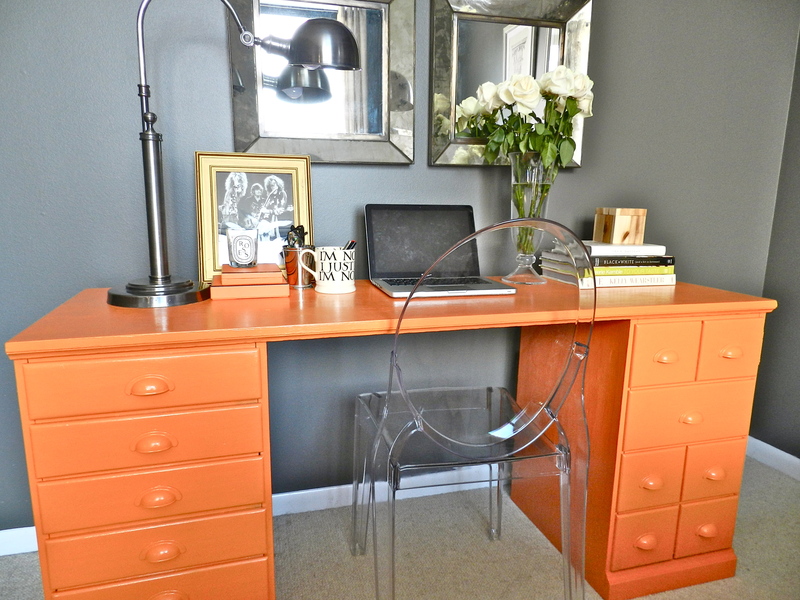 I’m hopeful that this bright orange desk will inspire creativity while blogging, and keep me awake while studying for law school! omg, i love the transformation of the desk!!!!! The color is sooooooooooo Hermes, great job!!! 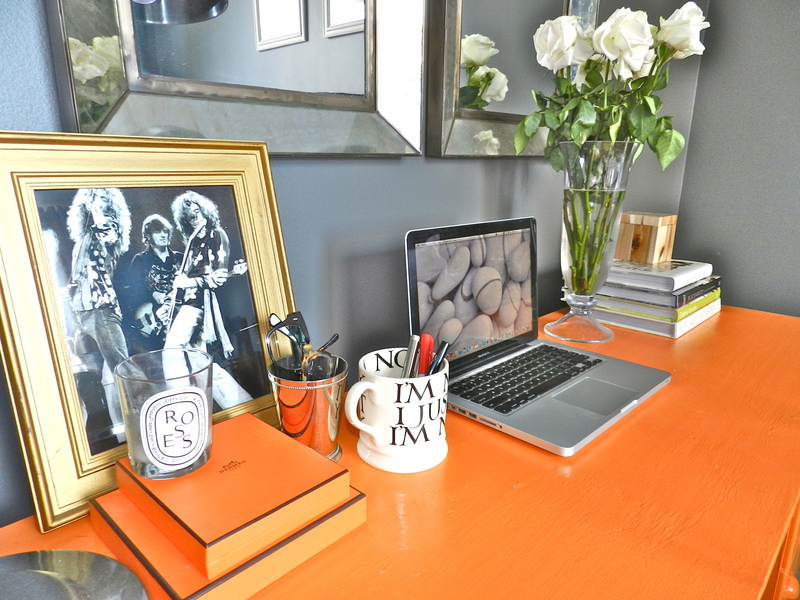 I love how you decorated the desk as well, with the lovely white roses, along with the 4 mirrors on the wall. I like it, orange evokes happiness and childishness..I especially love the 4 mirrors above. Well done!!! Oh, and the lucite chair!!!! Awesome modern cohesion!!!!!!!!!! Orange is one of my favorites. The makeover looks great! Reblogged this on Exhibit BEE. great work space! I love the mirrors! I love the color! 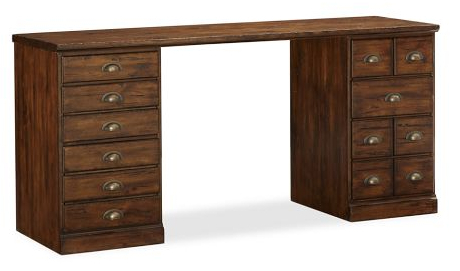 Where did you buy the desk? Thank you! The desk is Pottery Barn. love all of it! Where is the desk from? Opps! I forgot to say! It’s PotteryBarn. What a difference! It looks gorgy! Love the pop of color! Where are the four mirrors from?